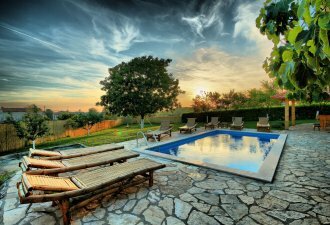 Villa Mira is a newly built villa which is located in the small village Pavletici near Kringa, approx. 21 km from the sea. Situated on its own enclosed garden of 700 sqm the villa offers to the guests an outdoor pool of 26 sqm, barbecue, siting furniture, covered terrace, children playground and a private parking for three vehicles. Villa with pool for 8-10 persons with a total living area of 230 sqm on two fully air-conditioned floors. On the ground floor there is a fully equipped kitchen with exit to the terrace, dining area, living area, double bedroom with its own shower/toilet and separate toilet. On the first floor there are three double bedrooms, each with its own exit to the balcony. One room has its own shower/toilet and the other two rooms have its own bath/toilet. In the basement there is fitness equipment.